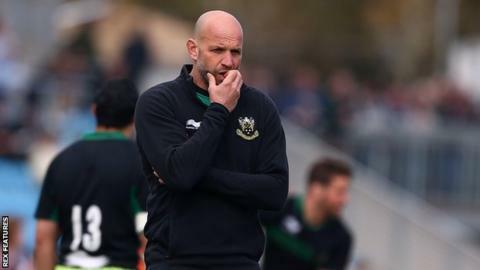 Northampton Saints director of rugby Jim Mallinder says Saracens deserve to be favourites ahead of the European Champions Cup quarter-final match between the two sides. Saints are the lowest-seeded team left in the competition, while Saracens are the top seeds. "Their key leaders are all playing well," Mallinder told BBC Radio Northampton. "I don't think I need to name names for people to know who I'm talking about." Saracens go into the game as the only team to win all of their pool games, earning victories over Ulster, Oyonnax and Toulouse. "They're playing very well," Mallinder continued. "They did lose a few games over the Six Nations, where they didn't have players available to them, but they've got those back now. "They're a very well-coached and difficult side to beat. We look forward to those sort of challenges." Saints will travel to London knowing a victory would take them through to an all-English semi-final, with either Wasps or Exeter Chiefs awaiting them. "The conditions are never easy down there, so sometimes you have the difficulty of what you do playing into the wind and then what you do with it," Mallinder added. "They (Saracens) have got this gameplan which they play very well. It's not as simple as kick-chase, but when they do kick they chase very well. "Once they get in behind you they're a difficult side to stop."